The .sport Ambassador & Pioneer program brings together a select group of sport sponsoring brands and sports pioneer websites. Using a .sport domain is a commitment to uphold community standards.. Sport stakeholders compete playing by the rules. They cooperate to organize sporting events, ensure fairness, and maintain a level playing field. Just as this applies to sport, it applies as well to the business of sport. The sport community operates its internet extension on the basis of strong community-oriented policies. Meaning, credibility, memorability, searchability, availability, persistence, portability: these are key advantages made possible in a dedicated Internet extension devoted to the cause of sport. Commercial alternatives on offer lack these advantages. In order to make most of its potential for the benefit of the entire community, the .sport extension applies the values of sport as they have evolved and consolidated over time: an open, objective, rule-based approach. Rules support fairplay, competition, participation, and transparency. The .sport Internet extension is placed under the authority of the International Sports Federations. Its rules support the sport community. Rules are designed to defend legitimate interests of community stakeholders, sponsors and brands. The .sport Internet extension is by the community. In 2012, the Global Association of International Sports Federations (GAISF), then known as SportAccord, applied to operate the .sport Internet extension on behalf of the worldwide sport community. Following contention resolution and related proceedings, the .sport extension was created in the root of the Internet Domain Name System on January 10, 2018. As a way to reach out to all parts of the Sport Community, GAISF has set up an advisory board for community-based policy development. This governing body is composed of representatives of international sports federations, IOC representatives, and is open to other sport stakeholders. As a consequence, the .sport top-level domain will truly be community-led and will be developed around the values, culture and principles of sport. The .sport extension will be introduced in several steps. The timeline has three major milestones: the exclusive Ambassador and Pioneer Program (AP Program), the Launch Period and General Availability (GA). The AP program is conducted by way of requests for proposals (RFP) and individual negotiations. The launch period allows applications through domain registrars and involves parallel phases (sunrise, priority, landrush) with distinction of priority. After the end of the launch period, applications are evaluated, follow-up conducted with applicants, contention sets (i.e. applications for the same domain name) are resolved, and successful applications created as domain names. Starting 2019, the .sport extension enters the general availability phase with a continuous registration mode. The pre-launch period from April 11 to September 4, 2018 is for ramp-up, registrar on-boarding and for the rollout of the Ambassador & Pioneer (AP) Program. The AP program is limited to a select group of iconic names in the .sport extension. There is a combined launch period during which applications can be submitted for six categories shown below. The categories also define relative priority in the event of contention, if more than one application is validated for the same domain name. End-date sunrise. Allows applications for trademarks in the ICANN Trademark Clearinghouse (“TMCH”) and which are used or commit to be used for sport-related activities. Eligibility under this category is subject to the Terms and Conditions set forth in Section 7 of the Launch Policy. Limited to eligible applicants belonging to this category. Restricted to predefined list of names corresponding to sport disciplines and subdisciplines in English and/or other languages, for example: gymnastics.sport (English), turnen.sport (German), гимнастика.sport (Russian), 体操.sport (Japanese), pentathlon.sport, motocross.sport . Limited to eligible applicants belonging to this category. Federations and other sport Governing Bodies will be allowed to apply for their names, including any clear variations and abbreviations thereof (e.g. acronyms) and other terms in common use to describe them. Public Authorities may apply for names which are used or to be used by them for sport-related activities. Limited to eligible applicants belonging to this category. Applications allowed for names corresponding to non-GAISF recognized sport disciplines and subdisciplines. Sport Clubs affiliated to Sports Federations will be allowed to apply for their names, including any clear variations and abbreviations thereof (e.g. acronyms) and other terms in common use to describe them. Limited to eligible applicants belonging to this category. Licensed athletes will be allowed to apply for their names, including any clear variations and abbreviations thereof (e.g. acronyms) and other terms in common use to refer to them. Open to other eligible applicants not included the previous 5 categories. Sport events organizers, sponsors, right-holders, sports-related media, and other sports-related corporate partners will be allowed to apply for their names as well as any clear variations and abbreviations (e.g., acronyms), their brands, and events. The .sport Internet extension is for the community. This means that everyone who plays by the rules is included, and also means that there are rules to protect legitimate interests, including the concerns of brands, sponsors, and the collective community. In addition to individual registration, there will be special programs for names categories that are subject to special requirements: discipline names, key sport vocabulary, geographic names and generic names. International and national sports federations and specialized institutions or groups of institutions will be able to use their acronyms in domain names based on the pattern <acronym>.sport . Clubs, teams and events can register their names, brands, slogans and acronyms under .sport so long as they are commonly-known by them. Athletes and their designated agents can register their name or well-known player’s nickname. The athlete should be licensed in the respective federation or have equivalent credentials in term of competition on international or national level. Most major brands have a substantial investment in sport sponsorship and sport-based advertising. A dedicated <brand>.sport website is the ideal way to showcase the brand owner’s sport marketing investment. A dedicated site which highlights a brand’s sport engagement is worth the extra effort because it enhances the value of the existing sport marketing investment and offers a pristine channel to the sport audience. At the same time, it shows the brand owner’s commitment to sport, and the values of sport. Credibility: a .sport domain serves as a credential of the brand’s role in the sport community. Searchability: a brand that uses sport advertising will be found more easily in searches involving sport keywords, due to the ranking advantage on systematic good-faith natural language matches applied by today’s search engines. Memorability: sport is a dynamic and meaningful context which makes the entire expression easier to remember. The .sport extension will support an ecosystem for media companies, publishers and publishing syndicates offering high-quality context-driven content through large numbers of generic and geographic .sport domains. This will be based on registration terms designed to achieve consistent user experience, the protection of user’s privacy as well as adherence to the values of sport. While standard .sport registrations are restricted the categories above, the .sport registry will support accredited content delivery platforms allowing users to register domains under the responsibility of the platform operator, subject to the content policies of the accredited platform operators. On this basis, sport practitioners at large, bloggers, fans and groups will be able to communicate under their own .sport identities. Moreover, thanks to the intrinsic portability of domain names, they will be able to transfer their domains from one accredited platform to another of the same type. Contrary to the categories of registrations where the registry exercises oversight, the accredited platforms involve a delegation of oversight, use of highly scalable technology, standardization, automated data and advertising support specific to the .sport extension, and low per domain cost to the domain registrant. What will there be under .sport domain names, and when? The domains applied for during the sunrise period will be activated in stages. The type of content visible to the public will evolve as the use of the .sport extension is gradually expanded. During 2018, the public will see .sport registry sites, select theme sites, and ambassador and pioneer sites. A limited number of iconic brands, clubs, athletes, events and governing bodies will become visible under the .sport extension in the course of 2018. Starting in 2019, .sport will see the general availability of individually-registered domain names for sport stakeholders: federations, clubs, disciplines, brands, themes, and cities. A user who visits a site with a name like “gymnastics.sport” or “baseball.sport” expects neutral, useful, responsibly managed information on the discipline. The user should also be able to expect that there is such a website for each major language and each major discipline. Sport discipline and governing bodies’ names will go live as early as possible after the end of the launch period, with successful individual applications seeing activation in late December. The .sport theme websites concern specific topics of value to the community. The .sport ambassador brands take precedence as prospective underwriters of .sport theme web sites and may propose their own. A given <theme>.sport website may have several ambassador brand sponsors. On a given <theme>.sport Ambassador brands have exclusivity in their respective industry sectors. The ambassador brands also help promote the theme sites; as several ambassadors of different industry sectors join forces in this respect, there is a multiplication effect of visibility reverberating back to the ambassadors from the theme sites. In the context of the AP Program RFP, the respondent can suggest additionals theme sites they wish to underwrite/support. Themes sites can start operations before the general availability of .sport and thus enjoy even higher visibility. In the .sport TLD, generic names are subject to rules protecting the interest of the affected parties and the sport community at large. Local authorities will be able to apply for their respective name, subject to special rules regarding identical location names worldwide. Portfolio-based allocation of geographic names is expected by 2020. It is expected that the majority of geographic names will be allocated in large mandate portfolios and operated by publishing syndicates on accredited platforms. In the .sport TLD, generic names are subject to rules protecting the interests of the affected parties and the sport community at large. It makes sure the operators of websites with name of the pattern <generic term> apply non-discriminatory policies with respect to the parties targeted by the meaning of the generic term. This is will be achieved by portfolio-based allocation in the form of mandates for operation by publishing syndicates on accredited platforms. The portfolio-based allocation of generics will start in 2019. The dotSport Ambassador & Pioneer (AP) Program is the exclusive pre-launch program commencing in April 2018. The 100 domains selected to be part of the dotSport AP program enjoy exclusive visibility until the end of 2018. The AP Program creates a nucleus of close working relationships between the participants. The AP Program has two groups of participants: Ambassadors and Pioneers. Ambassadors are commercial brands who wish to be strongly associated with the .sport ecosystem. They can take advantage of a unique opportunity to develop and communicate around their positioning in sport. The Ambassador will be able to launch its own <brand>.sport in pole position. 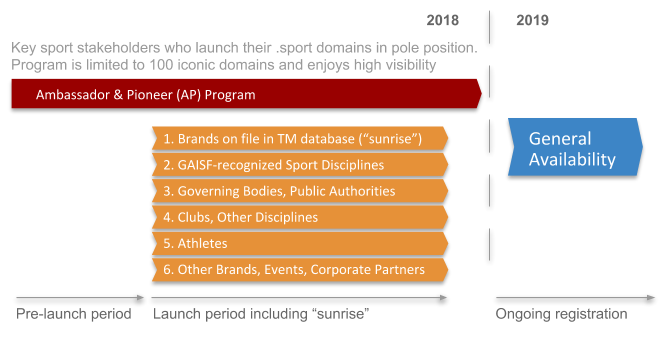 Ambassador <brand>.sport domains can be activated as early as April 2018, whereas other parties will only be able do operate comparable .sport domains from 2019 onward. The Ambassador will be able to operate one <additional>.sport domain proposed by the Ambassador and approved by GAISF. Ambassador <additional>.sport domains may be activated early as with Ambassador <brand.sport> domains. The Ambassador will be protected from the start through the protective reservation from registration of confusingly similar domain names. These defensive reservations apply to both the Ambassador’s <brand>.sport and <additional>.sport domains. They can be operated as active domains after the general availability of .sport (starting from 2019). The Ambassador will have a Gold Sponsorship presence in the upcoming .sport flagship portal. The .sport flagship portal is a dedicated domain registration and name reservation resource operated exclusively for the .sport Internet extension. It will start operating in May 2018. The .sport extension will also be available through any accredited domain name registrar. The Ambassador will have a prominent presence on dotSport launch events conducted by GAISF and its partners. The Ambassador will be offered valuable sponsorship opportunities on dotSport theme portals launched during the AP program. A dedicated <brand>.sport site is not intended to replace established commercial websites for most brands. However, for brands with major investments in sports sponsorship, a <brand>.sport site highlights upcoming events and serves as a showcase for the brand’s historic and longstanding relationships in sports sponsorship. Ambassadors not only secure exclusive ability to use to their <brand>.sport domains during 2018, ahead of the activation of other brand domains in .sport, but also the opportunity to highlight their respective brands’ past, present and future commitments as a sponsor, partner or creator of sport community events. Pioneers are sport stakeholders other than commercial brands who wish to develop their digital presence in the .sport ecosystem or to develop theme portals on .sport . They include sport governing bodies, sport clubs, athletes, cities/public authorities, broadcasters, publishing companies, and other entities with an organizing, practicing or publishing role in sport. The number of participants in the Ambassador & Pioneer Program is limited. In order to allocate Ambassador and Pioneer names optimally and balance the contributions of the participants, the .sport Registry is issuing a Request for Proposals (RFP) for the AP program. The AP Program RFP is directed towards brands, advertisers, advertising agencies, publishers, and branding agencies, broadcasters/streaming-content providers, sport governing bodies, sport clubs, athletes, athletes’ representatives, cities and public authorities. The .sport Internet extension is a project of the Sport community. It is entrusted to the Global Association of International Sports Federations (GAISF) which acts as Registry Operator and represents the Sport Community as contracted party to ICANN. The .sport extension is defined as a community-based top-level domain. See .sport Registry Agreement: https://www.icann.org/resources/agreement/sport-2017-11-16-en . GAISF, established in 1967, is the umbrella organisation for both Olympic and non-Olympic international sports federations. GAISF includes 92 full members (international sports federations governing specific sports worldwide) and 17 associate members (organisations which conduct activities closely related to the international sports federations). GAISF’s mission is to support, promote and serve its members and the global sport community by providing services in various fields, including digital development. The .sport extension operated by GAISF has been actively supported by international federations members and key global sports bodies, including the IOC (International Olympic Committee), UNOSDP (United Nation Office on Sport for Development and Peace) and WADA (World Anti-Doping Association). The .sport extension is part of a community-wide effort to build and maintain the Digital Playing Field, a set of standards, principles and resources designed to support the sport community ranging from sport practitioners, sport organizers and sport governing bodies to sport sponsors, sport advertisers and sport fans. CORE Association (Internet Council of Registrars) is a not-for-profit association of registrars chartered to contribute to the development of the Internet domain system in the public trust. CORE Association Registry Service Provider (RSP) is a partner of GAISF for the operation of .sport. Q: Is there a list of sport disciplines earmarked for international sports federations? 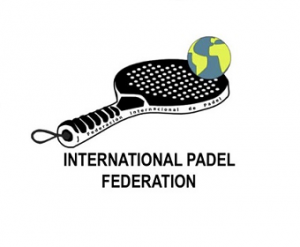 Q: Does .sport support Internationalized Domain Name (IDN) registrations? Q: Are number domains allowed, e.g. 123456.sport? Q: What is the minimum and maximum length of registered .sport domains? Q: What registration periods and grace periods apply? Q: Will every .sport domain registered or applied-for be validated by registry staff? Q: Is there a list of premium domains? Q: Is there a list of reserved domains? Q: Does a registrar have to fulfill special conditions to become a .sport registrar? Q: Does the .sport registry charge any fees to accredit a registrar? Q: Are there special requirements for brands to be registered as .sport domain names? Q: Can an individual register a .sport domain? Q: What registration paradigm will be used in General Availability, i.e. after 2019-01-08?